NK Architects was awarded two gold medals and one silver medal at AIA Newark & Suburban Architects’ annual Design Awards on Thursday, September 13, 2018. Kean University - Liberty Hall Academic Center: A center for history, community, arts and academics, the Liberty Hall Academic Center at Kean University is designed to provide a contemporary environment in which to teach, study and celebrate history in close proximity to the substantial historical significance of its namesake and neighbor, Liberty Hall Museum. 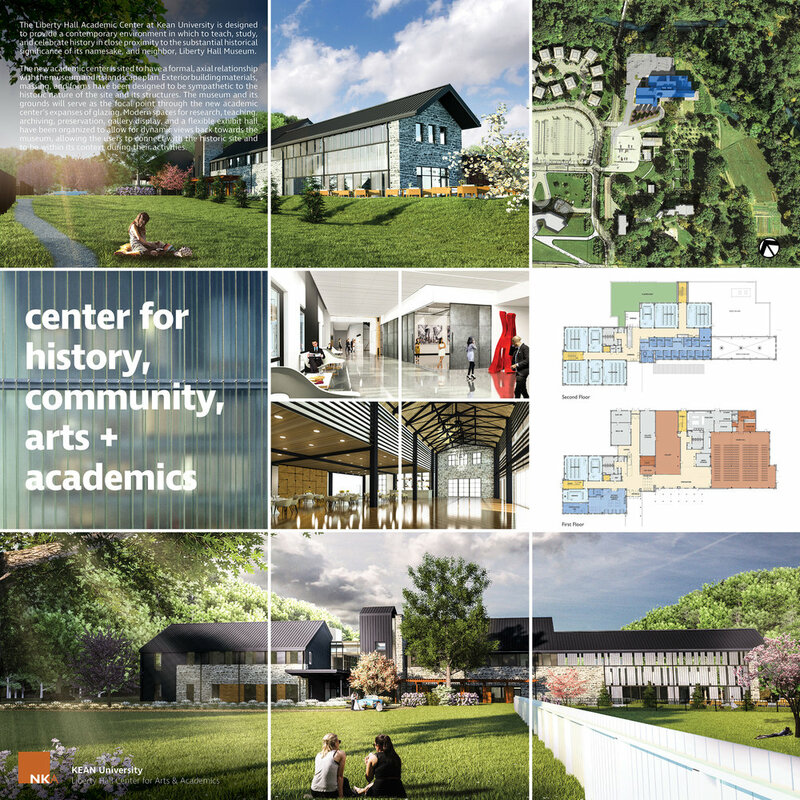 The new academic center is sited to have a formal, axial relationship with the museum and its landscape plan. Exterior building materials, massing and forms have been designed to be sympathetic to the historic nature of the site and its structures. The museum and its grounds will serve as the focal point through the new academic center’s expanses of glazing. 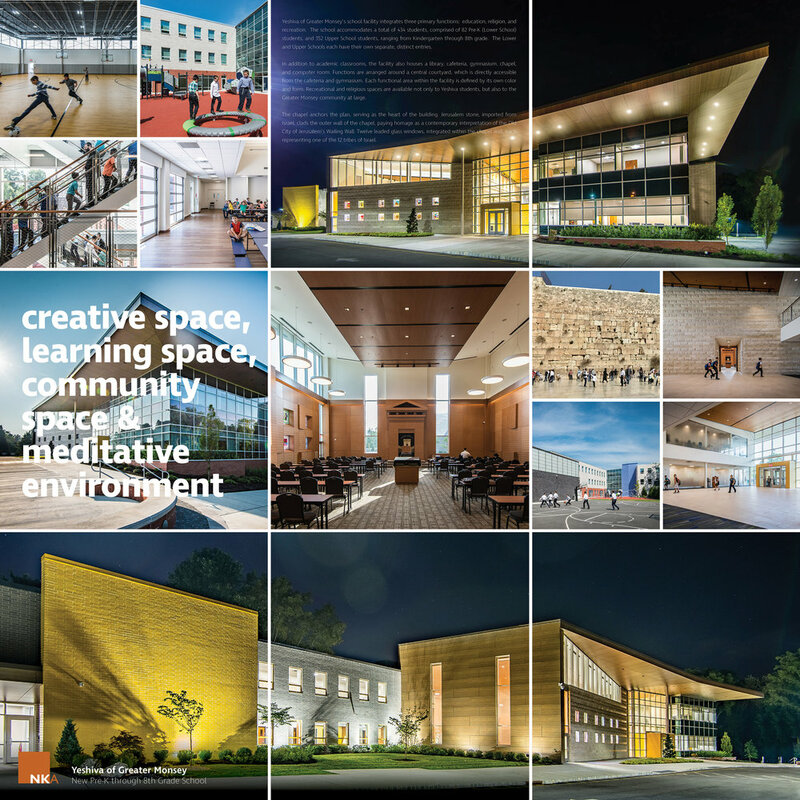 Modern spaces for research, teaching, archiving, preservation, gallery display and a flexible exhibit hall have been organized to allow for dynamic views back toward the museum, allowing users to connect with the historic site and be within its context during activities. Princeton University - Embodied Computation Lab: Commissioned by Princeton University, the project is simple in form but sophisticated in function. A true “open source building,” the Embodied Computation Lab hosts research on the future of construction and computation. Just as biologists use an electron microscope to study organisms, architects use this structure to study buildings. The modest shed-like form and rustic wood facade belie its function as a state-of-the-art classroom and workshop for research in advanced building technologies including automated construction, feedback systems, energy harnessing and new wall and roof assemblies. The building incorporates sustainability and low-carbon features throughout. The facade, composed of over 900 salvaged scaffolding boards from New York City, utilized the use of custom algorithms trained to detect knots in wood — bringing the power of machine learning to the physical world. Supporting flexible open-source utilization and adaptability, a third of its framework extends out beyond the enclosed structure, providing researchers with the bones to build out their own wall assemblies at full scale. Another example of this approach is the configuration of the heating system, while the lab currently harvests waste heat from the neighboring chemistry building, it is installed with equipment and controls to allow alternate sources such as geothermal well. Yeshiva of Greater Monsey - New Pre-K - 8th Grade School: Yeshiva of Greater Monsey’s school facility integrates three primary functions: education, religion and recreation. The school accommodates a total of 434 students ranging from Kindergarten through 8th grade. The Lower and Upper Schools each have their own separate, distinct entries. In addition to academic classrooms, the facility also houses a library, cafeteria, gymnasium, chapel and computer room. Functions are arranged around a central courtyard, which is directly accessible from the cafeteria and gymnasium. Each functional area within the facility is defined by its own color and form. Recreational and religious spaces are available not only to Yeshiva students, but also to the Greater Monsey community at large. The chapel anchors the plan, serving as the heart of the building. Jerusalem stone, imported from Israel, clads the outer wall of the chapel, paying homage as a contemporary interpretation of the Old City of Jerusalem’s Wailing Wall. Twelve leaded glass windows integrated within the chapel wall each represent one of the 12 tribes of Israel.